Each season brings new pests. Stay protected all year long with our comprehensive pest protection service. Knowing your personal space is invaded is the most uncomfortable feeling. Pests are unwelcome guests in your home, appearing suddenly, creating unsightly damage, and even becoming a hazard to your surroundings. With Prairie Pest Control’s residential pest control services, you can regain full control of your home or apartment. Prairie Pest Control services the Fargo, ND and Moorhead, MN area as well as the Minnesota lakes area. We help you get home pest control that is extensive, not expensive. No matter the season, pests will do their best to find somewhere warm and cause problems. With Prairie Pest Control, you get comprehensive pest control services year-round with prompt and courteous correspondence all-around. Your home will get a thorough assessment before getting the most fitting solution for your pest problems. We offer programs to keep pests away on a one-time or seasonal basis, depending on how extensive your problem is. As pests tend to crop up in the warmer months, we suggest a seasonal approach before and after summer to keep bugs away for good. Prairie Pest Control has interior and exterior pest elimination services. If you’ve noticed your home or cabin has been invaded by spiders, ants, bees, hornets, rodents, bed bugs, cockroaches, Asian lady beetles, flies, boxelder bugs, or others, we can exterminate them! Don’t wait to address the source of those spider webs and stains on bedding. Get back your peace of mind by calling Prairie Pest Control as soon as you see the signs of unwanted pests. When critters such as rodents, bed bugs, and ants start taking over your house, they can affect the quality of your life and cause unwanted damage. Even your best DIY efforts may not be enough to clear the problem. Hardware store sprays and solutions with only provide a temporary fix. If you don’t target them all, the pests will return. Your home should be treated like the sanctuary it is. Investing in home pest control is worth it. 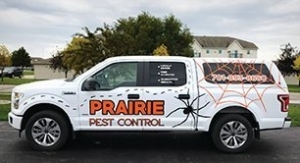 Prairie Pest Control has the equipment, knowledge, and professionals to get the job done right the first time. Our staff will answer your call right away and visit as soon as you can arrange it. We do a thorough inspection to assess the damage, location of infestation, and type of pest. Then, we consult with the homeowner about potential options. We carry out an effective treatment that specifically targets the type of bug, level of infestation, and location, to ensure you aren’t bothered any time soon. Hiring a residential pest control service now will prevent you from paying more significant costs to fix damage caused by pests. The sooner you notice bugs and rodents, the faster you should contact pest services to expertly handle the situation. Get the solution to your pest control problems in Fargo and MN lakes area and call us today!